By LUDWIG VON KOOPA - Plus, why the Nintendo Switch launch line-up is the way it is. I guess the big, stand-out news I care about (Animal Crossing on mobile garbage is delayed to after March, but no one's looking forward to that, right? It just means Nintendo only has three smartphone games out by March 2017, not five like they promised.) is how amazingly Pokémon Sun and Pokémon Moon did, sales-wise. The details of which are also pretty interesting. In the span of a few weeks, the two games put together are the third-best selling games of the Nintendo 3DS, ever. 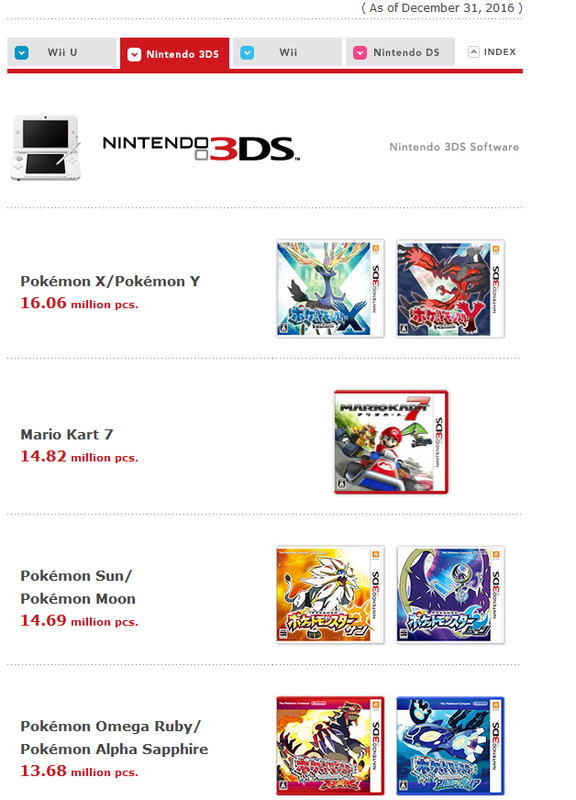 They'll probably surpass Mario Kart 7 very quickly, if they haven't already. Are these the Pokémon GO players coming to the 3DS and buying the new games? Did only having the Kanto Pokémon get featured Alolan formes pay off? How do we feel about Nintendo spying on our Activity Logs? We can only conjecture, especially since the 20 and 30 year old players might not be the same 17% of new Pokémon-on-3DS players! Look at all of those 3DS games! Source is Supplementary Information about Earnings Release. Nintendo promises to still support the Nintendo 3DS, even after the Nintendo Switch is launched and is trying to get whatever support it can. Between porting Wii U games to the 3DS, like Yoshi's Woolly World, and making games no one even remembers exists like Pikmin for 3DS and Mario Sports Superstars. Don't forget a Fire Emblem remake (among other Fire Emblem crap)! Well... Okay, I guess they're free to do that. Obviously they've totally abandoned the Wii U, but one of the big things with the Nintendo Switch is that all of Nintendo's development teams could focus on one system, instead of two. On the other hand, the teams or indies or whomever that still can't handle HD development can still make things for the 3DS until they can. They're still not totally shut-out by this new world! If you're wondering why the Nintendo's Switch line-up appears to be “weak”, as Kimishima himself put it, it's to basically drip-feed and avoid a drought. I guess that implies everything is already done, but they don't want a calendar drought. Like the Wii U did. Fair enough. I'm more worried about a drought of the Nintendo Switch console itself. Nintendo has some supply issues they need to work out. They also noted the Nintendo Entertainment System: NES Classic System sold 1.5 million units... and could've sold more, had they made enough of them. Ludwig still hasn't memorised the spelling of Tatsumi Kimishima's name, which is pretty bad. All of KoopaTV's staff, besides Roxy and Wendy, own either Pokémon Moon or Pokémon Sun, so KoopaTV definitely contributed in a small way to those sales numbers. KoopaTV covered the February 2016 financial documents here. Forget nine months: Let's look at the whole year! Oh, and Pokémon Sun/Moon makes another accomplishment. I'm not sure how Sun and Moon's sales were so "amazing." I mean, as the very data you've displayed here shows...waaaaait a minute. This isn't just data for each game's first month or whatever, is it?! In little less than a month or whatever, Sun and Moon has basically tied with evergreen mainstay Mario Kart 7. I do think Pokémon Go helped Sun and Moon's sales. When Pokémon Go came out, suddenly Pokémon was a major phenomenon again. People who never talked about it before were playing Pokémon Go, and I think they'd have to be at least a little intrigued when they heard about another Pokémon. Another thing I think helped is how Sun and Moon made a point of being different. The trials, the new battle features, even the graphics/style (one of my friends commented right away that the characters look proportional now) made them look fresh and different, instead of just another Pokémon game. I have friends who haven't played a Pokémon game in years, who got Sun/Moon because it seemed so much more impressive to them. I like to think it's mostly the second paragraph of stuff than the first paragraph. It's one thing for Pokémon merchandise and stuff to increase in sales because of Pokémon GO, because that did happen. It's another thing for Genwunners to buy a 3DS just to play Pokémon Sun or Pokémon Moon and not play any other Pokémon game. 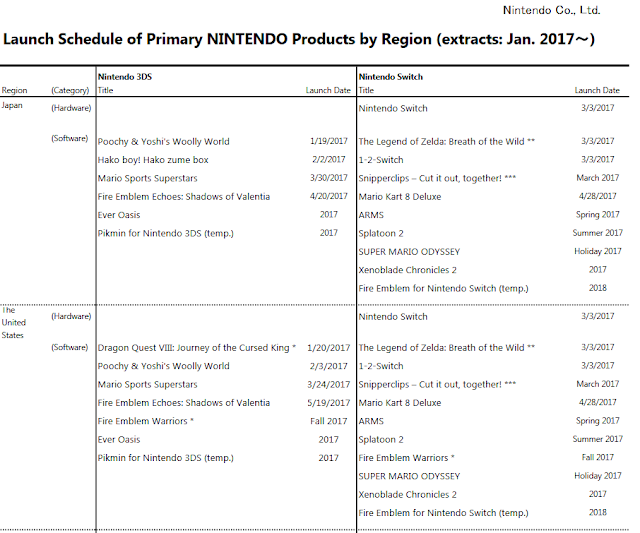 Remember, Kimishima's statement also means these GO-ers wouldn't have even purchased the Virtual Console version of Red, Blue, or Yellow! And surely these GO-ers know how digital storefronts like the eShop work — after all, they're normally iOS users (or Android). It's more likely that Pokémon GO increased the interest in Pokémon in general among people who already owned a 3DS or were inclined to, and so the people who own a 3DS but not a Pokémon game (aka most 3DS owners) might've been the reason for the increased sales. Yes, I'm that determined to delegitimise Pokémon GO and/or its fanbase. It's also possible, though, that newcomers to the series who got interested because of Pokémon Go found out that a brand new game was coming soon and decided to wait for it, to make Sun/Moon the first main-series Pokémon game they tried. Sometimes people want to start with the newest game. So now I'd like for you to produce data suggesting that. First, that Pokémon GO had a sizable number of newcomers to the series, and then they purchased a 3DS, and then waited for the new game. If it weren't for Pokémon GO, honestly, Pokémon Sun and Moon would... still come out. The thing is, however, no one else would've been willing to research for an original Pokémon game. I also believe that Pokémon 20 contributed IMMENSELY towards its success! If anything, I believe the actual audience (not intended, mind you) of Pokémon Sun and Moon travelers would appeal to the younger, more YouTub-ier generation. After all, why play a video game when you can watch someone else play it? Personally, I know a kid wbo hardly takes anything I do seriously, and... somehow has invested more time in Pokémon GO than me. He didn't get Sun nor Moon. I just believe Pokémon - 20th Anniversary is a bigger contributor than Pokémon GO, even if it brought back an older generation. In my opinion, it's not a lot, if only by a couple of millions, company-wise (of course, I'd LOVE to have millions of people buy some products from smaller businesses). Do you consider Niantic a small business?